This rapid prototyping training course for UX teaches skills for effectively communicating and testing concepts and ideas. Learn rapid prototyping testing concepts to apply before making large investments in final UX design. Discover how to easily and quickly build low-fidelity prototypes using both analog and digital prototyping methods. Find out how to use rapid prototyping and UX principles to reduce development time while improving the experience of users. No previous experience with any prototyping tool is required. This course is suitable for those designing or managing development of websites, mobile apps, or desktop apps. Whether you create websites, mobile apps, line of business apps, or games, you'll benefit from this rapid prototyping course. Learn how to reduce the time to build, while improving the experience for your users. 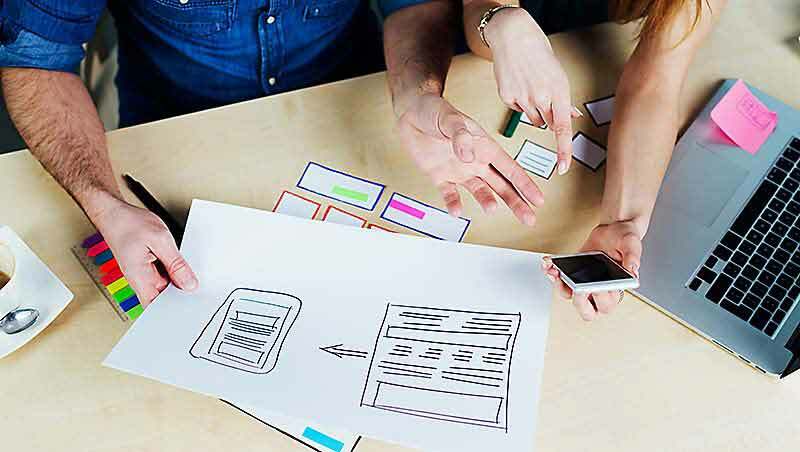 This one-day rapid prototyping course is suitable for anyone involved in the app design and development process, including: business analysts, UX designers, application developers, web developers, and product managers. Because the course is focused on process rather than a specific platform, it is applicable whether creating apps running on iOS, Android, Windows, Mac OS, Chrome, or HTML5. Our Rapid Prototyping class is a one-day class that allows attendees to create and follow-through a project from start to prototype. Students can choose an app or website, or focus on a work-related project for this class. Many companies organize group training for this topic and set up teams of 5. This not only makes this a great learning experience, but a team-building opportunity as well. The pace is quick and very dynamic. Questions about this rapid prototyping for UX design class? Interested in a private or customized rapid prototyping training? Call to speak with a training consultant: 781-376-6044. You can take this rapid prototyping course in our classroom with a live instructor in the same classroom with you. It is available at our classrooms in Boston, New York City, and Philadelphia. These regularly scheduled, public rapid prototyping workshops include small groups of professionals from various companies. A typical live rapid prototyping class involves a small group of between 6 and 10 participants, along with the instructor. These in-person classes include both individual and group exercises, along with reviews of user experience projects conducted in class. These in-person UX courses are one day in length, and open to the public. We can also deliver this rapid prototyping course as a private UX workshop for your group or organization. This rapid prototyping class is also available as part of our live, online UX courses from American Graphics Institute. The online UX courses are conducted with a live instructor, and are also limited to a small group. You can hear and see the instructor and their presentation, talk with them, ask questions, and participate in individual projects. Both class formats include the same lecture materials, and are led by the same team of experienced faculty from American Graphics Institute. There are no prerequisites for this UX course. You will receive a comprehensive course manual for this class developed by the UX instructors at American Graphics Institute. AGI instructors have authored many design and creative technology books, including the Digital Classroom series of books. Design tools that allow for the creation of prototypes are also provided.